Acne is a complex disorder of the pilosebaceous unit (hair follicle-sweat gland complex) with many subtypes. 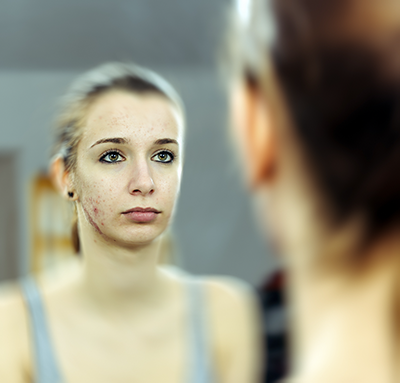 Acne is caused by plugging of the hair follicle, leading to comedone formation (“white heads and black heads”), aberrant sebaceous (oil) gland activity (usually under the influence of male hormones), and a bacteria called Propionibacterium acnes. Women with acne and excess hair growth in a male pattern and irregular periods may have hyperandrogenism and a diagnosis of Polycystic Ovarian Syndrome should be investigated; this can be diagnosed with blood testing in our office. Although many patients may eventually outgrow acne, early treatment is necessary to prevent scarring, persistent redness, and uneven texture. 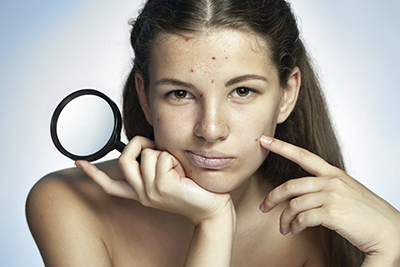 A treatment plan is tailored to each individual based on the unique acne subtype. Treatment involves a combination of lifestyle change, topical treatments, and oral therapy such as isotretinoin (e.g. Accutane) or anti-testosterone tablets (Aldactone), as indicated. We offer numerous office procedures as well to speed the progress, including Isolaz, chemical peels, microdermabrasion, and lasers for acne scarring. Our physicians have extensive experience with isotretinoinfor acne and bloodwork may be performed in our office for your convenience.